Every outdoor speck of red in North America will be checked out at least once by a hummingbird. That makes it utterly easy to attract hummingbirds. Just interest them with something red, and then reward them with sweet (flowers or feeders with nectar). Although the right flowers are the best way to provide hummingbirds with food, hummingbird feeders are a quick way to get started. A feeder we love is Dr. JB's Clean Feeder. It completely comes apart, and all the parts go in the dishwasher, so you can keep the entire feeder perfectly clean with no work. It's sturdy and isn't going to fall apart on you. Female hummers love to use spider webs for construction. The springy fibers make cushiony, elastic walls. They hold the whole nest together and yet allow for expansion as the baby birds grow. But if you don't happen to have a lot of spiderwebs around your house, you can offer a substitute nesting material that some hummingbirds seem to like even better than spiderwebs. It's called Hummer Helper. Many of our customers have tried it and then ordered again and again, because it works! 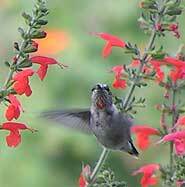 Mass plantings of the right flowers will turn your garden into a hummingbird haven. Some flowers have been bred to look nice in a garden but have lost their nectar in the bargain. 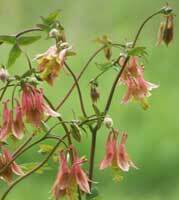 Try native wildflowers that naturally feed hummingbirds, such as columbines. Every area of the country has its own columbine. In the Midwest the red columbine opens just when ruby-throated hummingbirds arrive. The columbine feeds the hummer, and the hummer pollinates the flower. Flowers are the ultimate hummingbird attractors. Red ones especially, but other colors will do also. My hummers come eagerly to coral bells, bee balm, and petunias. I've had phenomenal luck with hummingbird sage (also called Texas sage.) It's easy to grow, it comes back from seed all by itself, and hummingbirds keep the whole patch buzzing all summer long. Don't forget the birdbath. Hummingbirds like water too. This tiny ruby-throated hummingbird dunked his head just like the bigger birds do. I feel fortunate that I get to watch for hummingbirds in spring. It's great fun to notice the amazing changes in the bird life that take place as the seasons cycle. Although a few hummingbirds hunker down for the winter along the southern border of the US, most of the country is devoid of hummingbirds during the winter. Anna's is the one common year-around resident hummer, except along the southern border of the country. Anna's is mainly found in the west. If you live in Oregon, Washington, or central or northern California, this is the hummingbird you've been seeing all winter. This photo is copyright 2012 Raymond Ho. Thank you, Raymond, for giving us permission to use your photo. Soon Allen's will be joined by Costa's, Allen's, rufous, and calliope hummingbirds. Further inland you'll soon be seeing black-chinned and broad-tailed hummingbirds. For easterners away from the Gulf Coast, ruby-throated hummingbirds are the whole hummer show. 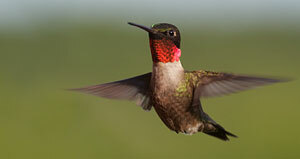 Ruby-throats arrive on the Gulf Coast beginning in February and start making their way north. By May they've spread out over most of eastern North America. Images of hummingbirds © Michael and Diane Porter 2008-2012. This bright red baffle keeps your feeder cooler, so it stays fresh longer. And at the same time it attracts hummingbirds. First Flight is a wonderful new DVD lets you watch all the details of a hummingbird nesting. Get to know the mother hummer as an individual. There's a new DVD that shows how ferocious hummingbirds are when they are hungry or in love. It's Beauty and the Beast, and it's terrific! Hummingbirds of the Backyard emphasizes attracting hummers to your garden. Hummingbirds of North America is will teach you to identify every hummingbird of North America—males, females, and immatures. For the serious student of hummingbirds. Great movies and information. Elegance? Take a look at the Hummingbird Lantern, by Schrodt. Fill the bottle with sugar water, put the base back on, hang it up outside, and watch the hummers come for it. Made from imported French bottles and recycled redwood, with brass fittings, the Hummingbird Lantern is made almost entirely from natural materials.